At this point, there should be no doubt in anyone’s mind that civilization, especially industrial civilization, inherently destroys the land. It’s part of the very nature of this culture. If you need any more convincing, research into the history of mining in the Great Basin will provide you evidence aplenty. Today, we bring you an excerpt from a book called “The Piñon Pine: A Natural and Cultural History” by Ronald M. Lanner from the University of Nevada Press, originally published in 1981. This passage discusses the impact of the mining boom in Nevada in the mid- and late-1800s. We invite you to read this passage, and to reflect that modern mining, far from being less destructive, might even be worse, due to the bigger machines, more toxic chemicals, and abundance of fossil fuels (as well as the fact that such mining, once restricted to small areas, has metastasized around the world and destroyed some of the most beautiful and pristine lands on Earth). The production of mineral riches would not have been possible in 19th-century Nevada without the piñon woodlands and their vast supplies of wood. The opening of a mine was only the first of many operations necessary to convert hard rock into treasure. Huge labor forces had to be brought into work the mines and to build and operate stamp mills, smelters, amalgamators, and concentrators. Lumber in enormous quantities was needed for these operations: timbers for shoring the mine shafts, charcoal for smelting ore, cordwood for heating and cooking. The great Nevada Silver boom ran on wood. Every new mining district was on its own at first; there were no roads or rails to bring in lumber or coal from other regions. Instead, the miners had to make the best of their local resources, and they did so with a vengeance. Here we will only scratch the surface of a historical process that has never been given its rightful share of attention: the deforestation of vast areas in the Great Basin for the production of mineral wealth. Nevada’s mining boom began with the Comstock, a great lode of silver at the western edge of the Great Basin, a few miles from the foot of the Sierra Nevada. When mining began in 1859, the mountains for miles around Virginia City were covered with piñon and juniper. These local forests were rapidly depleted. By 1868 John Ross Browne reported that the supply of local wood was “entirely exhausted,” and cordwood was being brought in from Dayton, 12 miles distant. Even these woods were quickly being destroyed, and wood had to be packed in on mules from inaccessible areas back in the mountains. Piñon was selling for $16 a cord, most of the cost going for transportation. The population of the district had reached 20,000 and the daily consumption of fuelwood was 568 cords. Already it was becoming necessary to bring in wood of inferior quality from the Sierra forests. Meanwhile, the mines of the Comstock were consuming 18 million board feet of timber annually, much of it for shorings in the tunnels. But the most important use of piñon wood—both ecologically and economically —was for production of the charcoal used in smelting ore. In these days of electric blast furnaces, we tend to forget that metallurgy once depended on mountains of coke made from coal; and before that, on mountains of charcoal made from wood. As early as 3200 BC, Egyptian technicians use charcoal to reduce copper ores in Sinai. In ancient Greece, charcoal production was an important occupation that led to the wholesale cutting of forests around the copper smelting centers of Chalke, Chalkis, and Chalkitis. At the beginning of this century a mammoth blast furnace in Ontario ate its way through a pile of charcoal half a mile long every 24 hours. It took a stack of cordwood 1 mile long for the charcoal needed to produce 150 tons of pig iron. And iron still depends on wood charcoal in countries where coking coal is unavailable. In 1968 a team of experts was sent by the UN food and agriculture organization to Honduras, to plan the wood harvest for an operation that would produce 50,000 tons of pig iron annually. They estimated it would take 220,000 m³ of pine a year, which would require clearcutting over 1000 acres of forest every month. The importance of charcoal lies in its efficiency as a fuel. It burns hotter than wood and produces far less waste. Thus, the profitable exploitation of Nevada’s silver deposits—except the rich lodes around Virginia City, which required no smelting—depended on the availability of high-quality piñon charcoal. Consider the environmental impact of the smelting operation. 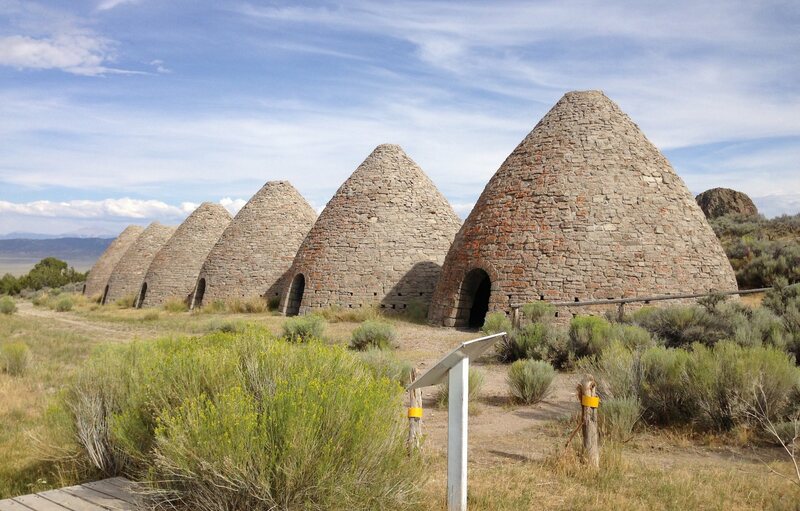 Judge Goodwin described Eureka, in an official document of the Nevada legislature, as a smelting camp over which rolled black clouds of dense smoke from the furnaces. These were heavily scented with fumes of lead and arsenic and were constantly depositing soott, scales, and black dust, giving Eureka the aspect of an industrial town in Pennsylvania’s coal region. But outside the city, the effects were even more severe and long-lasting. A typical yield of piñon pine was 10 cords per acre, and a cord made about 30 bushels of charcoal. So the furnaces of Eureka, working at capacity, could in a single day devour over 530 cords on its own, the produce of over 50 acres. An additional 20 acres a day were being cut to provide cordwood for the mills. After one year of major activity, the hills around Eureka were bear of trees for 10 miles in every direction. By 1874, the wasteland extended 20 miles from town, and by 1878 the Woodland was nowhere closer than 50 miles from Eureka, every acre having been picked clean by the carbonari or by domestic foragers. Biodiversity & Habitat Destruction, Mining & Drilling Deforestation, History, Nevada, Piñon-Juniper, 1: Civilization can never be sustainable. permalink. … and now the foreign mega-mines are poised to aid in a new wave of massive pinyon-juniper deforestation on BLM and FS lands. through funding agency killing of pinyon-juniper as “mitigation” for being allowed to build new mines in sage grouse habitats. The Nevada state sage-grouse plan and the BLM plan is based on elaborate economic model scheming for deforestation (and other destructive actions) as grouse mitigation. This means the aboveground footprint will dramatically expand – beyond the huge mine pits, toxic tailings, and roading associated with the mine itself – to laying waste to arid forests that often include several hundred year old trees. Also, the lands that Interior has begun a process for withdrawing from mineral entry are only a fraction of the grouse habitats. It’s open season for mining in the rest. …and yet we read, comment, and publish this on our computers, tablets, and smart phones; all of which consume the very minerals being mined and causing the devastation today. Rare earth minerals for our technology and lithium to power our devices, hybrid and electric cars. If we did not purchase these things creating a market there would be no profit in it. Blame corporations and governments all you will but a quick look in the mirror will reveal the true villain. You can not be a consumer of the end product and claim the damage done is someone else’s fault. Either own it and shut up or give up your current lifestyle. You can not have it both ways less you are a hypocrite.